For centuries, researchers have studied the brain to find exactly where mechanisms for producing and interpreting language reside. Theories abound on how humans acquire new languages and how our developing brains learn to process languages. 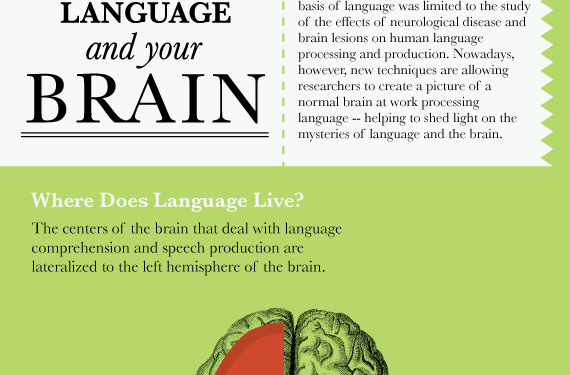 We take a look at the mysteries of language and the brain in the infographic below. Note to teachers: Continue reading below for ideas on how to use this graphic in your classroom! We think that infographics are an awesome learning and teaching tool, so our creations will always be available for you to print out, use with your students and embed on your blog! Before handing out the infographic, discuss the following question with your students: What gives humans the ability to acquire and learn languages? 1. What is the most surprising fact that you discovered from this infographic? How would you diagnose him? Why? 3. How might a patient with Wernicke’s aphasia describe the same image (from question 2 above) of three people in a kitchen? 4. fMRI is one of the most widely known brain imagining techniques. However, it is not the best technique to use in certain scenarios. Describe a situation in which researchers would need to use an imaging technique other than fMRI. 5. Are biological or environmental factors a greater influence on how we learn language? 6. Do you believe in the critical period hypothesis? Why or why not? Give evidence from your own language learning experiences. Many of us know people who seem to pick up languages effortlessly. Ask your students to interview someone that they believe to be a successful language learner. In particular, they should ask their interviewees to describe how they were able to master their new language(s). Following the interview, students will write an essay or blog post that 1. summarizes the information gathered in the interview and 2. reflects on whether or not language learning abilities could be wired in our DNA/brains. Alternative assignment for students without someone to interview: Have them search YouTube for videos of 3 polyglots who describe how they have successfully learned multiple languages. Using the information from these videos, students will complete the same writing prompt as those who have chosen the interview option. This entry was posted in Archive and tagged brain, chomsky, infographic, language, language acquisition, skinner. Win an iPod Nano from Voxy!